Just minutes ago, Hartford Financial announced that they has repaid the US Treasury the $3.4B that HIG had borrowed during the crisis. With this out of the way, the stock price should now be free to breakout above the current range. Looking at the chart $28.50 has been strong resistance so any solid break and close above it would signal a higher range going forward. The Hartford paid $3.4 billion to the U.S. Treasury to repurchase the preferred stock, plus a final dividend payment of about $21.7 million. The Hartford funded the repurchase with proceeds from its recent equity and debt offerings, as well as from available resources. The U.S. Treasury continues to hold warrants to purchase approximately 52 million shares of The Hartford’s common stock at an initial exercise price of $9.79 per share. The company does not intend to repurchase the warrants from the U.S. Treasury. Synovus Financial (SNV) was hit pretty hard today by the FBR analyst downgrade. The stock slid all the way down to $3.17 or over 8% at one point. Evidently the downgrade caught some investors off guard as it didn't highlight anything new and basically just offered a different opinion to that provided by management. One that should've been a concern of any investor. FBR claimed that SNV wouldn't be profitable this year as management claimed and that the bank wouldn't likely be bought out. Not really sure who would buy an unprofitable regional bank on a buyout hopes other then small retail investors. The whole reason to buy SNV is that they trade very cheaply compared to normalized earnings (see Tom Brown for more detail). Finally the merger between AerCap Holdings (AER) and Genesis Lease (GLS) will be finalized today creating the largest independent airplane leasing company. Its also creates a earnings powerhouse. For 2010, they expect to earn well over $2 with the stock trading below $11 now. A PE of 5 is absurd now that global growth has returned and most of their customers should see growth even in the US market. Not to mention that 5 years earnings growth is placed at 12.5% meaning a fair valuation would be around $25. Took a gamble yesterday and apparently we'll win out with this pricing. Some of the details of why we're very bullish on this stock. 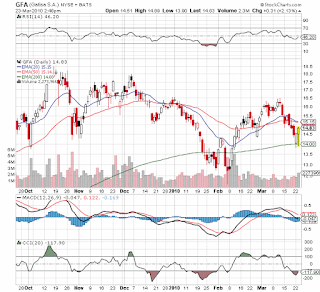 After just trimming our positions in Gafisa (GFA) on the 17th, we jumped back into a full position in the Growth Portfolio on the drop to the 200EMA. Also, added it to the Opportunistic Portfolio for the first time. The drop from $15 to $14 didn't last long. Our average purchase price was around $14.13 and the stock is now around $14.77. 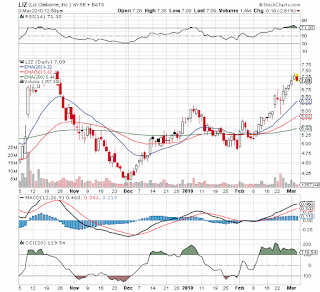 The stock has mainly been weak due to an expect secondary offering possibly after the close tonight. It might dip again tomorrow in the am but any weakness should be bought. GFA is a leading Brazillian homebuilder with decades of growth ahead. HealthCare Passes the House But Will the Market Selloff? At 10:45EDT the House of Representatives narrowly passed the Healthcare Reform bill. Logically it seems that the market would tank on such news. Honestly though, the reform bill was so narrowly passed (219-212) and it will likely cost numerous Democrats their seats at the November election. Politico has a good run down of the seats on the edge. Does this really give Obama the freedom to unleash his agenda? After all, that is the real fear in the market. Binky is the chief equity startegist at Deustche Bank. His target for year end is 1325 making him more bullish then us at this point. Listening to the clip we do agree to most of his ideas, but we're more concerned above stock prices towards year end if all these taxes on investment income actually increase. Gotta take into perspective that 1250-1300 only takes us back to where the market was pre-Lehman collapse. Yes, the market has come a long way, but he fell way too far. With SP500 earnings expected over $80 now, 1325 isn't that far fetched. Especially went $95 for 2011 is becoming more realistic. $95 x 15 gets the market back to 1425. Might seem far fetched but when you review the real numbers surrounding corporate profits the questions should become 'Why Not?'. With a name like Binky he better be good as well. Not sure what to make of the very weak action in the stock prices of small financials like International Assets (IAAC - old FCSX) and Phoenix Cos (PNX) that Stone Fox Capital holds in the Growth Portfolio . Both were down nearly 8% today. 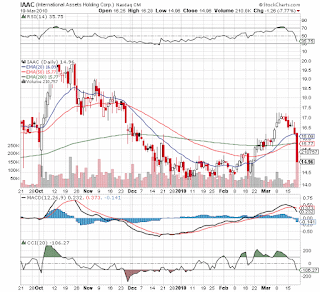 Luckily we sold a good portion of IAAC earlier this week at $17.04. Unfortunately we didn't sell all of it! Both stocks are only 1.2% of our portfolio and we'll look to add to those positions on Monday assuming a lack of negative news. The move down could be related to quadruple witching today. Charts look very weak so buying is risky. IAAC at $14.50 has a natural stop there and PNX at $2.50 to start or all the way down to $2.20. In order to raise some cash for the Growth and Hedged Growth Portfolios we sold roughly 50% of our positions in both Gafisa (GFA) and Foster Wheeler (FWLT). Both stocks have traded weak of late with GFA dropping below its 20 & 50 EMAs and FWLT being unable to get above the 20EMA even with such a strong tape. Long term though we still like the macro situation for both stocks. Short term we let the charts tell us that the action might turn bearish. GFA is doing an offering next week so that explains the weakness on that stock. With FWLT, its difficult to see why it remains so weak. The news seems bullish and it continues to trade at much cheaper levels then a competitor like Jacobs Engineering (JEC). Foster Wheeler(FWLT) estimate changed at Barclays. FWLT 2011 EPS estimates introduced at $2.50, 2010 maintained at $2.30. Reiterate Overweight rating and $38 price target. While not a huge accomplishment it is at least a start considering my focus is on investing money and not writing, but alas sometimes writing is an ends to the means of attracting investors. Or maybe its just that I have an opinion on some matters and hope to at least be heard in some small way. Thanks to everybody that follows me on SeekingAlpha.com. Now at 102 followers as I write this tonight. Still nothing compared to the top guy - Pragmatic Capitalist - wtih 28,250 followers. Its wasn't long ago that just a 1,000 was huge. SeekingAlpha is really taking off as the place to read up on investment ideas. Future Stat of the Week: 300K Jobs Added in March? One thing explaining the meltup in March is that some analysts are now expecting 300K+ jobs during March. This isn't really a future stat for this week, but its a crucial future stat. Its also likely the first major jobs gain in what could be the start of dozens of months of gains. Brian Westbury from First Trust has a nice video about the expectations for March jobs and more specifically his estimate that we'll report 300K. Now what will that mean to the stock market? Hard to tell as we've had a huge run since mid-Feb. In general though, I still see lots of stocks trading below intrinsic values. 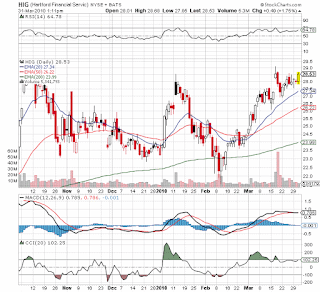 Hartford Financial (HIG) trading way below book. 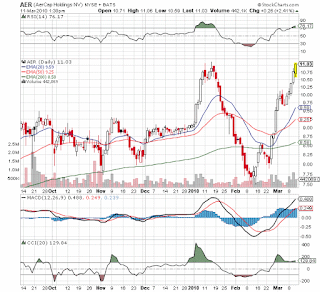 AerCap (AER) trading at 5.5x 2010 earnings. Puda Coal (PUDA) trading below 10x their low end guidance of $1.10. Those are just a few examples of how cheap the market remains. 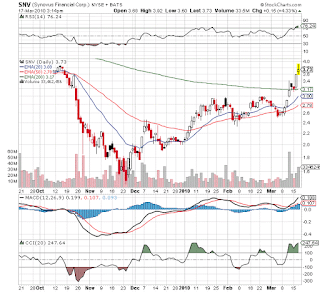 Synovus Financial (SNV) has been on fire the last week As of this afternoon it was roughly 25% over the 20EMA and the RSI was 76. Both indications that the stock is extended so we sold roughly 33% of our shares in the Growth and Opportunistic Portfolios. We'll add the shares back as the stock cools down or approaches the 200EMA around $3.17. After the close Hartford Financial (HIG) announces plans to repay TARP. They owe $3.4B so they've chosen to do a combination of equity and debt financing. Considering the equity portion is only $1.45B this appears bullish to us. The offerings announced today will consist of $1.45 billion of common stock and $500 million of mandatory convertible preferred stock, represented by depositary shares. The debt offering related to the repurchase of the government's preferred stock will consist of $425 million of senior notes. In addition, the company will pre-fund the repurchase of its senior debt maturing in 2010 and 2011 through the issuance of an additional $675 million of senior notes.Considering how cheap HIG is compared to book value and EPS, this move could finally unlock that value as shareholders have been hesitant to load up with TARP hanging over them. Even the downgrade by Piper Jaffray couldn't keep the stock down today. 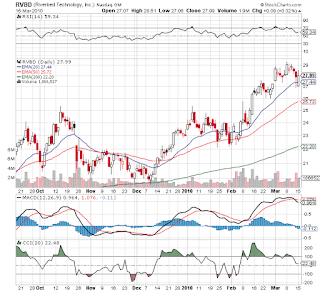 Riverbed Tech (RVBD) looked like it would break below the 20ema at $27.44 but it was too strong to remain weak closing at $27.99. RVBD is the biggest holding at around 7% in our Growth Portfolio and one of the largest holdings in our Opportunistic (CV.IM) model. At this point, we're happy to hold a stock that can hold support especially on a downgrade. China is the largest user of coal and now they've become a major net importer in the last few years. Although China has embarked on several programs to focus on renewable energy sources such as solar and wind they will rely on coal fired electricity for a long time with some sources estimating that China will nearly double coal use by 2030. The coal industry in China is very fragmented. Many of the coal mines have been operated by small companies leading to very inefficient mines and a high injury rate with several tragic mine accidents. Hence, the government has embarked on a mine consolidation plan in order to move the majority of the mines into the hands of larger operators that will be more efficient and easier to regulate. The program will reduce the number of mine operators from 1,000 to 100 while also significantly shrinking the total number of mines. In less then 6 weeks the Covestor Model is already reporting strong results. The model is already up 17% versus a little under 5% for the market. Not bad considering the model was down 4% on its first day of February 3rd. A day the market dropped over 3% so not great timing there. Also remember that the model is up over 150% since it began in Dec 2008, but CVIM only counts the record since I became live on their Interactive Brokers platform. They do have the link to the history though for verification. Of the 46 managers on the CVIM site, our Opportunistic Model ranks 2nd in the MTD results (click on MTD in the upper right corner) at over 13%. Check on Monday morning when they update the results from Friday and it'll be up 14%. We're proud of being 2nd because although this is an aggressive portfolio it is up against several daytraders and undiversified portfolios giving them alot more leverage for out sized short term gains. AerCap (AER) has one amazing chart over the last couple of months. The merger with Genesis Lease (GLS) should be finalized on the 25th reducing the risk and finally allowing the stock to move forward. Hard to understand what caused the stock to collapse from $11 to $7.5 and then rebound right back to $11 today. Is it now a double top? Likely not, but it does need to consolidate the recent gains. See the RF chart from yesterday as thats the likely scenario for this stock. Trading at only 5.5x the $2 in earnings expected this year the stop at $11 will likely only be short term if at all. Slow to report this but yesterday we bought the Direxion Small Cap 3x Bear (TZA) in the Growth, Hedged Growth and Opportunistic Portfolios. The purchase in the Hedged and Opportunistic Portfolios amounted to nearly 10% of the portfolios though the Opportunistic purchase was just to offset the margin currently in that count bringing the net bullish investment to just 100%. 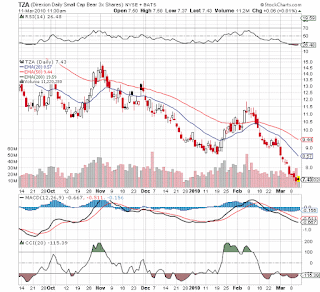 TZA was purchased because it was and is extremely oversold having an RSI of 25 yesterday and a CCI below -100. Both signs that a reversal is likely. Small caps have just been too hot lately so we expect at least a minimal pullback. For the Hedged Growth Portfolio this is on of the first hedges/shorts that we've used in the last year since the March 9th low. Most importantly to us, Regions Financial (RF) and Synovous Financial (SNV) our both up sharply today. 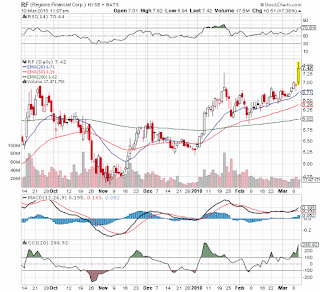 For RF its clearly partly technical as they hit new 52 week highs and breakout from a double top. For SNV its like just a move with the sector today. 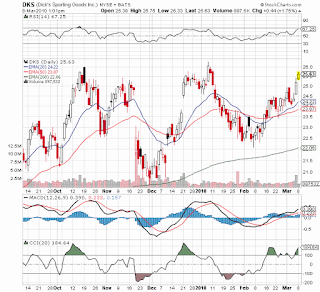 Cramer was bullish on banks yesterday and in general the tone seems to be improving. The Opportunistic/CVIM Model is doing the best today as it has a higher concentration in those 2 stocks while the Growth Portfolio is also gaining in large part to a high concentration in the financial sector at roughly 20%. Though it contains much more of Hartford Financial (HIG) and ICICI (IBN) then these 2 regional banks. The chart on RF looks similar to how we expect the SP500 to go over the next few weeks. Initial weakness at the recent high (Jan in the case of the SP500) and then support from the rising 20ema and an eventual push to new highs on the 3rd try at 1150. Being the anniversary of the Bear Market low on 3/9/09, today seems like a good day to review our performance since then. When March started last year, we were about ready to give up. So many stocks were unbelievable buys yet the market kept spiraling down. A year later we feel vindicated as all 4 portfolios have easily beat the market since we started tracking them back in 2008. The Opportunistic Model had the biggest gain in the last 12 months at 165% (200%+ by our calculations) followed closely by the Growth Portfolio. Going forward, were looking towards another strong year as the markets likely provide another solid gain in the 2nd year of this bull market. Its very unlikely that a bull market dies after only one year. As always we'll adjust the portfolios if it appears that the market won't continue the rally. At some point in late spring or summer we're like to finally face a true 10% correction so 2010/2011 won't be as easy as the last 12 months. As of last week, Covestor Investment Management (CVIM or cv.im) began offering my portfolio as one of their Model Managers. This is a great opportunity to expand investors to the group that typically invests in mutual funds. It gives investors with only $5K the opportunity for individually managed accounts that in the past required at least $100k and in most cases $250K to open an account. Unlike a mutual fund you get the opportunity to see current trades and portfolio holdings and you have visibility to your assets via 3rd party brokerage Interactive Brokers (IB). So anybody worrying about giving their money to an investment manager ala Madoff no longer has to fear never seeing that money again. The money remains in your name and you alone have discretion over transferring in and out. CVIM only obtains the ability to execute trades and collect fees. 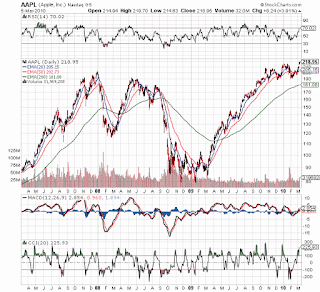 Incredibly Apple (APPL) hit another new all time high today. Ok, it's not really all that incredible to us considering we've suggested $300 and $1,000 [Apple to $1,000] targets during 2009. Still its very rare for a tech stock to exceed the 2000 high. Part of the reason for the jump today was just the overall market, but it didn't hurt that Cramer was pushing the stock last night on his Mad Money show. Cramer is bullish because the new Apple iPad product is gaining key corporate support especially in the Healthcare and Legal areas. Read doctors and lawyers. That could really feed into Mac sales as well. With the cash on hand and what could be yet another strong product with the iPad, AAPL is likely a must own for the next couple of years. Amazing report if its true. Looks like Japan is having to pay up get assets such as coking coal used to make steel away from the grips of China. Alpha Natural Resources (ANR) is likely our best play with their decent supply of coking coal. Puda Coal (PUDA) is a great speculative play in China. More to come on that stock. This is the difference between coal and natural gas. China needs coal. China doesn't need natural gas. JFE Holdings Inc. reportedly agreed to pay $200 per ton for coking coal in a three-month deal with Australian coal miner BHP Billiton Ltd.The amount was higher than expected, said William Burns, an analyst with Johnson Rice & Co. Burns, who expected JFE and other companies to pay only about $150 per ton, said this shows how aggressive countries have become in competing with China for natural resources. "China has become a black hole, and the Japanese steel makers are trying to lock up their supply," Burns said. ISM Non Manufacturing (Services) report came in at 53 today versus the 51 estimate and the 50.5 for January. In fact, most economists were likely expecting the number to dip below last month considering weak economic reports such as consumer confidence and intial jobless claims and the severe snow storms in the east. The business activity (54.8) and orders (55) suggest a V shaped recovery is indeed on the way while the employment index at 48.6 provides for great profits opportunities. This may not be good news for your neighbor that is unemployed, but it should help corporate profits and hence stock prices. After all, if your activity/orders increase but you have less people/costs your profits should soar. 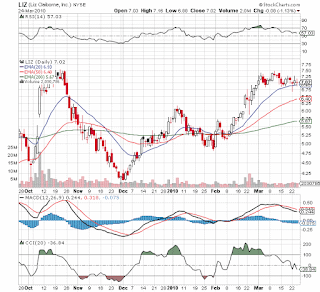 Liz Claiborne (LIZ) has been a favorite stock of Stone Fox Capital for a while now. The stock was looking extended on the both the CCI and RSI measures. It was also approaching a double from October so we pruned 50% of our position in the Growth Portfolio at $7.26 leaving 2,000 shares. We'll be looking to buy that position back if the shares trade back to the 20EMA which is at 6.32 today. It's also discouraging that the stock is down in an up day. Another sign that it might need to rest before trying to breakout of the double top. Just a little update on the Growth Portfolio that now has over a 20 month history. It's now up 125% over the last 12 months which is 69% more then the SP500. This leads to a 13.5% annualized return in excess of the SP500. * All below returns are actually 0.75% higher on a annualized basis then the below numbers due to our tracking system at Marketocracy.com assuming a 2%+ annual fee versus the 1.25% for this portfolio.